Our Personalised Elephant bib is both practical for any little accidents your baby boy may encounter during his meal times and is a perfect gift to remind you how precious he is everyday. 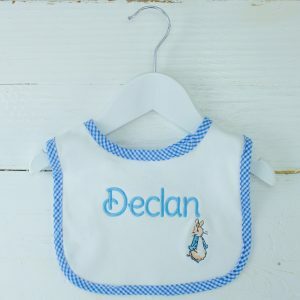 This Personalised Baby Boy Bib comes with our printed elephant design alongside his name for a truly unique keepsake making them a great gift for baby showers and newborns! 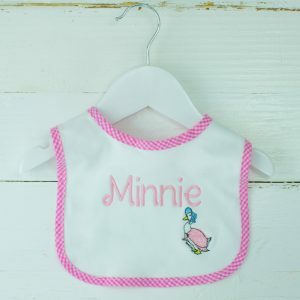 Make sure your baby girl is looking her best at meal times with our beautiful Personalised Jemima Puddle Duck Bib, expertly crafted for a super smooth finish! 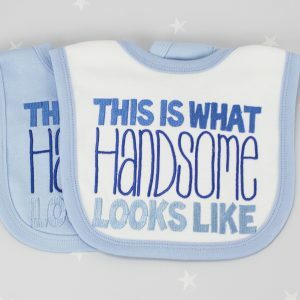 Make sure your baby boy is looking his best at meal times with our beautiful Personalised Peter Rabbit Bib, expertly crafted for a super smooth finish! Introducing Heavensent's uniquely designed children's nursery rhyme bib, both practical for any little accidents baby may have and a perfect gift to remind you how precious they are everyday. 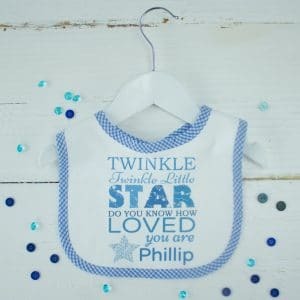 This Personalised Baby Boy Bib comes with our printed 'Twinkle Twinkle' Design alongside their for a truly unique keepsake making them a great gift for baby showers and newborns! Introducing Heavensent's uniquely designed children's nursery rhyme bib, both practical for any little accidents baby may have and a perfect gift to remind you how precious they are everyday. 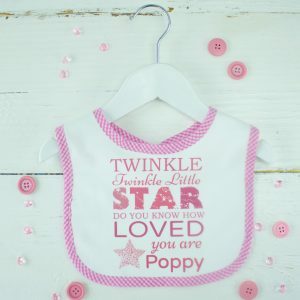 This Personalised Baby Girl Bib comes with our printed 'Twinkle Twinkle' Design alongside her for a truly unique keepsake making them a great gift for baby showers and newborns! Our Personalised Unicorn bib is both practical for any little accidents your baby girl may have and a perfect gift to remind you how precious she is everyday. 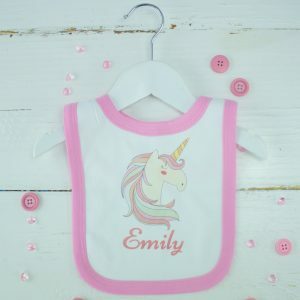 This Personalised Baby Girl Bib comes with our printed unicorn design alongside her name for a truly unique keepsake making them a great gift for baby showers and newborns! Our Personalised Teddy Bear Bib is both practical for any little accidents your baby may encounter and a perfect gift to remind you how precious they are everyday. This Personalised Baby Bib comes with our printed teddy bear design alongside their for a truly unique keepsake making them a great gift for baby showers and newborns! 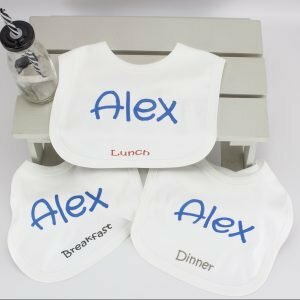 A personalised bib is an absolute essential for any parent during their baby's meal times that will help keep their outfits fresher for longer and cut down on the washing .... Dinner time has never been so cute! 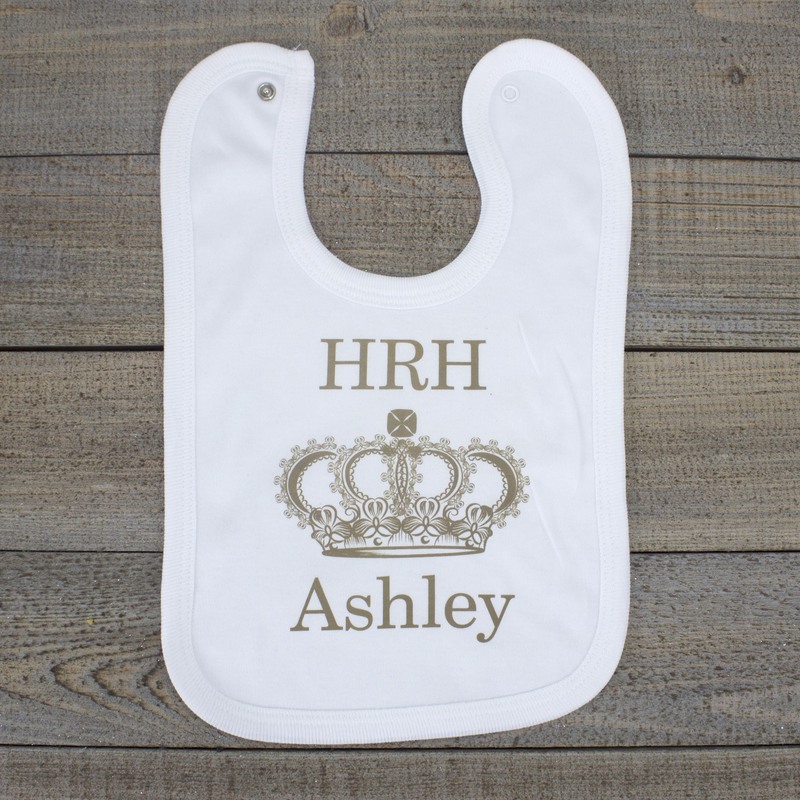 Make sure your baby boy is looking his best at meal times with our beautiful Personalised 'HRH' Baby Bib, expertly crafted for a super smooth finish!